This festive children's bracelet combines shiny white pearls, light pink flowers and a sweet heart. 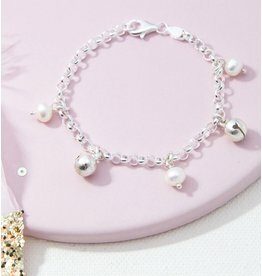 Beautiful bracelet for girl - girl. Also very suitable for bridesmaids. Beautiful necklace made of freshwater pearls and pink glittering Swarovski crystals. Beautifully on a white dress or a bride. The chain hangs a sweet heart sphere (the chain can be made without charm or another charm).